14.212.300 Street Types and Design. A. Street types. Street types identified in this chapter designate the various configurations of streets in the Pilchuck District. These street types are in addition to the street types described in the City’s adopted Engineering Standards applicable to other portions of the City. Pilchuck District street types and designs vary according to the available right-of-way, the adjacent urban use and form, and the functional requirements of the roadway. In all cases, roadways are intended to provide for both motorized and non-motorized transportation modes with slower design speeds to ensure the safety of pedestrians, bicyclists, and motorists. 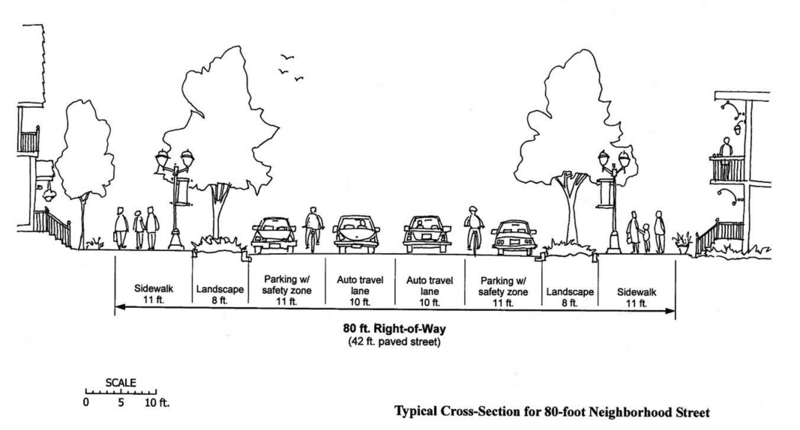 Street standards for Neighborhood, Access, and Community Corridor types include on-street parking, ample sidewalks, pedestrian lighting, and street trees. Intersection design for these classifications should include frequent bulb-outs to promote the safety and convenience of pedestrians and to emphasize slow traffic speeds. The woonerf or pedestrian street type is intended to allow vehicle access as secondary to pedestrian and bicycle access. Due to its intended function, woonerfs do not require separated sidewalks. Woonerf design, including form, relationship of elements, features, and materials should be individually adapted to each circumstance based on the needs of adjacent development, emergency access, anticipated secondary functions of the right-of-way, and community input. Design standards and classifications for individual roadway segments within the Pilchuck District are shown on Tables III-1 and III-2. 1. General provisions applicable to all street types. a. Designing landscaped areas within the street right-of-way to be functional stormwater treatment and infiltration or conveyance is encouraged. b. Right-of-way ends at the Pilchuck River may be designed as pedestrian gathering and recreation spaces. c. Street intersections at the Centennial Trail should include features indicating the potential presence of trail-users. d. Pedestrian crossing improvements, including bulb-outs and special pavements, shall be evaluated at the time improvements to specific intersections are proposed. a. Purpose. Where adjacent development is primarily residential, provide attractive streets with ample sidewalks for pedestrian comfort and interaction. 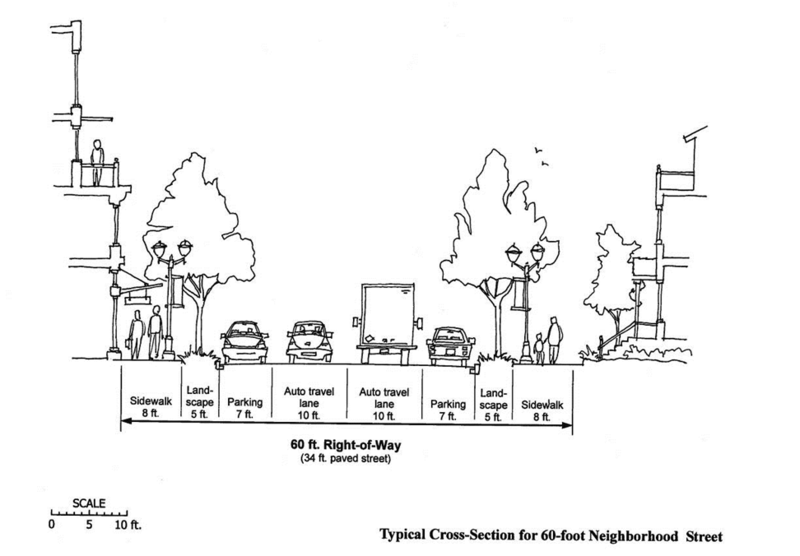 Sidewalks should be separated from travel lanes by on-street parking and a treed planting strip. Travel lanes should be marked at the minimum width necessary for safe passage to encourage slow speeds. Where adequate area for bicycles is not available outside of travel lanes, the lanes should be marked with sharrow symbols to remind motorists of the presence of bicycles. Private frontages along Neighborhood Streets shall be designed to include moderate setbacks providing spaces for porches, gardens, and lawns for both privacy and connection to the public way. 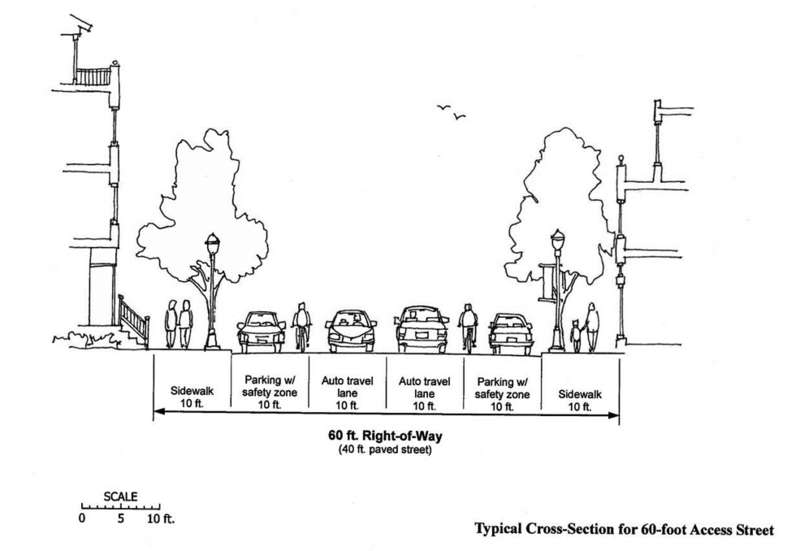 i. On-street parking shall be oriented parallel to the curb. ii. Spreading, deciduous street trees shall be located in the planting strip at a maximum interval of 40 feet on-center. Appropriate street trees are listed in Chapter 14.240 SMC. The location of street trees may be modified to preserve sight lines and to avoid conflicts with street lights. iii. Low-lying ground covers may be located within planting strips. Shrubs may be located in planter strips where conflict with vehicle doors is minimized. iv. Pedestrian and street lighting shall be incorporated at sufficient intervals for pedestrian, bicyclist, and driver safety. Decorative light fixtures no more than 14 feet above finished grade are preferred for pedestrian lighting. Light fixtures shall be shielded to avoid light spill into dwellings. v. The standard roadway sections for Neighborhood Streets are shown on Figures III-1 and III-2. a. Purpose. Create an active “Main Street” pedestrian environment for a mixed residential and commercial context. Provide wide sidewalks with pedestrian amenities to serve as safe and sociable entry areas for residential uses and flexible outdoor space for adjacent commercial uses. Travel lanes should be marked at the minimum width necessary for safe passage to encourage slow speeds and to create a refuge space for bicyclists. Private frontages along Access Streets should be minimal. 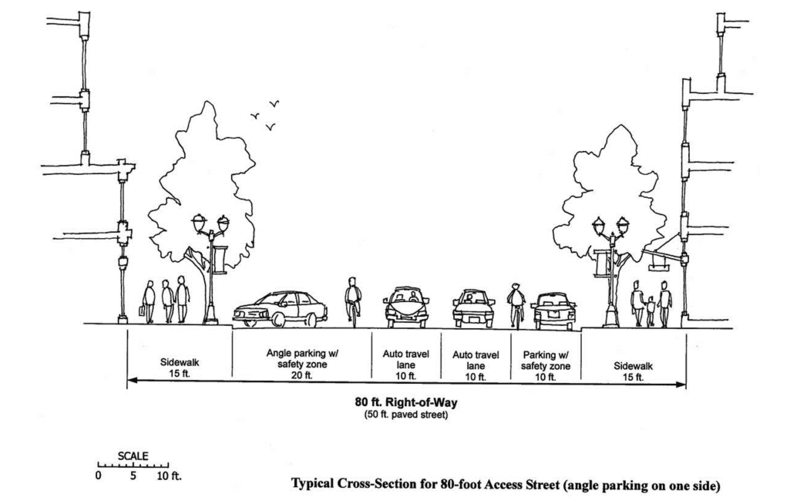 i. On-street parking shall be parallel to the curb except that angled parking shall be provided on one side where rights-of-way are 80 feet wide. ii. Spreading, deciduous street trees shall be located in sidewalk tree grates at a maximum interval of 50 feet on-center. Appropriate street trees are listed in Chapter 14.240 SMC. Street trees shall be located to minimize obstruction of street views of storefronts and building signage, to avoid conflicts with street lights, and to allow emergency access to upper floors with aerial ladders. iii. Sidewalks shall integrate with commercial private frontages to create a seamless transition between public and private spaces. Alternative sidewalk surfacing may be permitted where the alternative surfacing extends over the majority of the block adjacent to the Access Street. Alternative sidewalk surfacing shall meet all applicable safety and accessibility standards and shall be the responsibility of the adjacent property owner to maintain and restore. iv. Pedestrian lighting shall be provided on or along building faces. The light sources should be located no higher than 14 feet above finished grade. 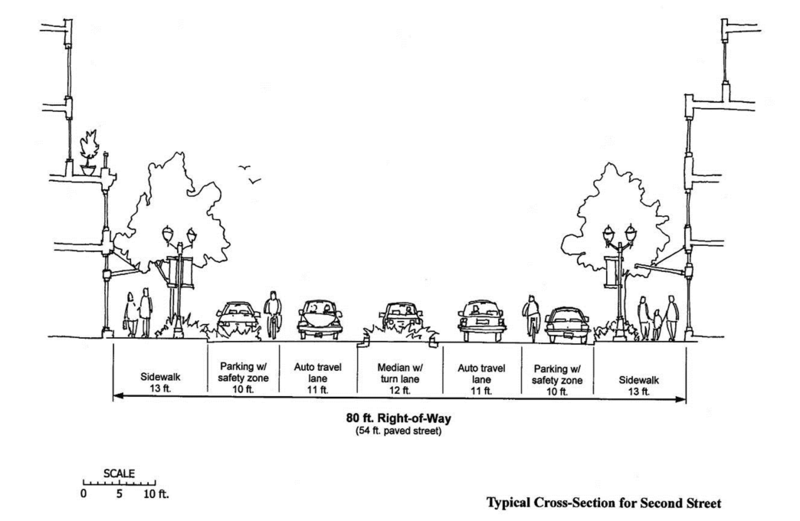 v. The standard roadway sections for Access Streets are shown on Figures III-3 and III-4. 4. Community Corridor (Second Street). a. Purpose. 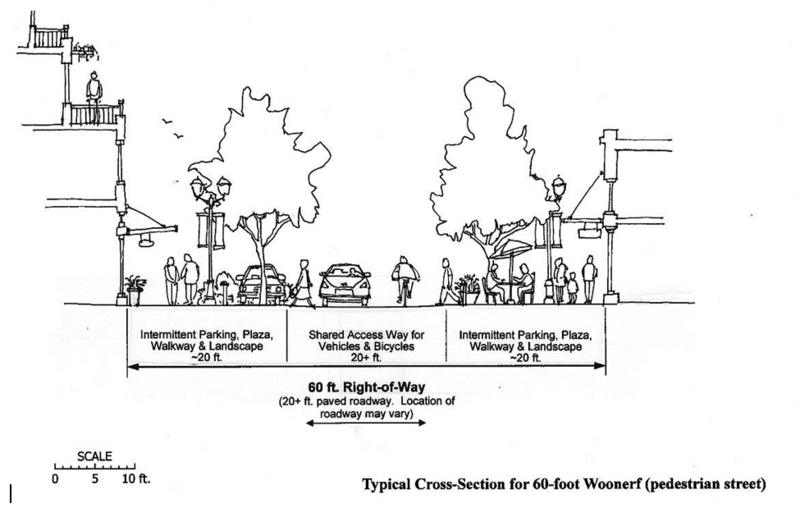 Create an active “Main Street” pedestrian environment for predominantly commercial streets. Provide wide sidewalks with pedestrian amenities for comfortable strolling, shopping, and outdoor seating and marketing displays where such uses will accommodate pedestrian access. Streets and sidewalks should be designed to incorporate transit stops, where appropriate. Travel lanes should be of adequate width to efficiently accommodate significant volumes of traffic including large trucks and transit, while providing refuge areas for bicycles. The Community Corridor includes a center turn lane punctuated with a planted median, where feasible. i. On-street parking shall be parallel to the curb in parking lanes of sufficient width to allow safe access to and from parked vehicles. ii. Spreading, deciduous street trees shall be located in sidewalk tree grates at a maximum interval of 50 feet on-center. Appropriate street trees are listed in Chapter 14.240 SMC. Street trees shall be located to minimize obstruction of street views of storefronts and building signage, to avoid conflicts with street lights, and to allow emergency access to upper floors. v. Street lights should be centered between street trees to avoid conflicts with tree canopies. vi. Significant bulb-outs and wide crosswalks with contrasting surface materials are encouraged at pedestrian intersections to create a safe and comfortable pedestrian experience. vii. Historic appearance standards for street lights and traffic signals are encouraged. viii. The standard roadway section for a Community Corridor is shown on Figure III-5. a. Purpose. Create flexible public spaces where vehicles, bicycles, and pedestrians safely share the right-of-way. Woonerfs should function as extensions of the adjacent properties to encourage active and passive community use, while accommodating traffic movements. Woonerfs will be designed on a case-by case basis to respond to the needs of adjacent land use and to allow for flexibility in use and programming. i. Woonerf materials should be an alternative to asphalt pavement, where possible, include very limited or no traffic signs, no standard lane demarcations, no curbs except as necessary for stormwater management, and no sidewalks. ii. Opportunities for on-street parking should be considered in the design of woonerfs where parking will not functionally or aesthetically dominate the space. iii. A 20-foot wide emergency access way shall be incorporated within which no parking and no fixed or temporary facilities shall be located. iv. Landscaping should be included in the design of a woonerf, including trees and planters where they will not create safety hazards or conflict with emergency access to adjacent development. v. Lighting should be evaluated and incorporated with woonerf improvements at sufficient intervals for pedestrian, bicyclist, and driver safety. Light fixtures shall be shielded to avoid light spill into dwellings. vi. Woonerfs may vary from 40 feet to 80 feet in width, depending on the available right-of-way. vii. 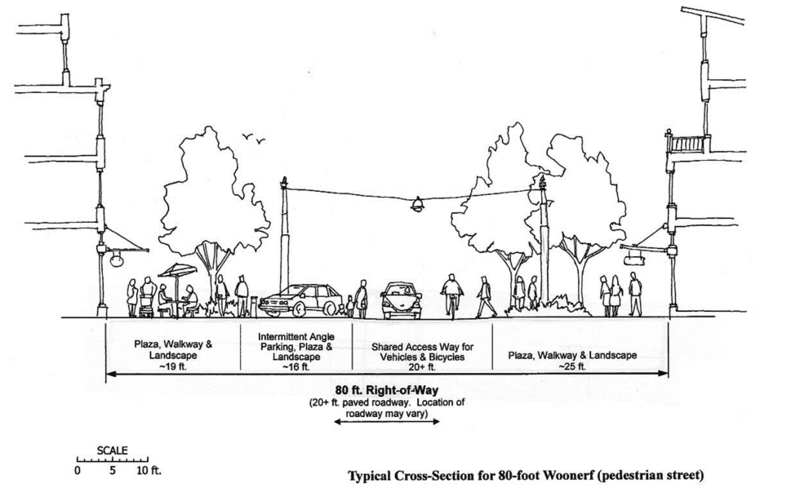 Conceptual roadway sections for 60-foot and 80-foot woonerfs are shown on Figures III-6 and III-7.